Essay, Blog, Tweet: Nonfiction now! This class is designed to advance students’ writing practice, discipline, and workshop and critiquing skills. Student writers will create non-fiction narrative in several forms: blogs, memoir, interviews, Q&As, essays. We will play with promotion, video, and social marketing, even grant proposals, advertisements, public service announcements, queries, and photo captions—all the forms that writers actually use throughout careers of deep reflection followed by hustle-and-pitch. 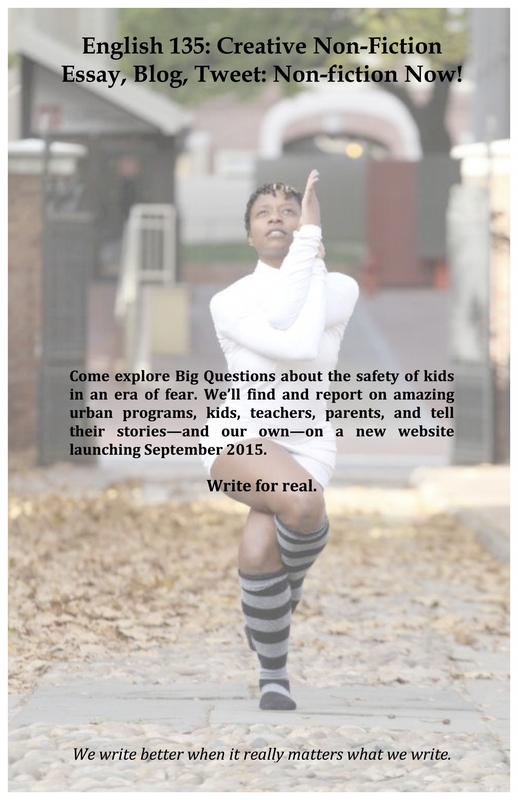 The class will act as an editorial group for SafeKidsStories.org, a site to be launched in the fall of 2015. The idea is to depict safety with the specificity and drama that we usually reserve for conflict. Your writing will explore Big Questions about the social, emotional, relational and physical structures that affect our children and youth; your research, interviews, reporting, and experience will discover and share solutions. If we do the job right, we will shine a light on people in our midst creating structures of safety for kids in an era of fear. If we make it fun to read, look at, and listen to, too, then, like a few historic college courses that participate substantively in their communities, we’ll be on our way to stealth culture change.